Each of the 20 plays featured is accompanied by an extraordinary wealth of print and online supplementary materials, including primary critical sources, commentaries, illustrations, and reviews of productions. 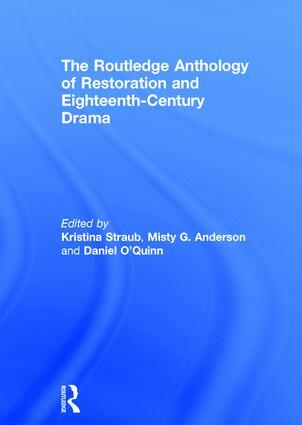 Taking in the spectrum of this period’s dramatic landscape—from Restoration tragedy and comedies of manners to ballad opera and gothic spectacle—The Routledge Anthology of Restoration and Eighteenth-Century Drama is an essential resource for students and teachers alike. <online> F.D. Waldron, Excerpt from The Virgin Queen, a Drama in Five Acts; Attempted as a Sequel to Shakspeare’s Tempest. John Wilmot, Earl of Rochester, "The Imperfect Enjoyment"
Image: Daniel Marot, "Design for Queen Mary’s China Room." Image: Sir Peter Lely, "Diana Kirke, later Countess of Oxford"
<online> John Ogborne, Dorothy Jordan in the character of the "Country Girl." <online> Aphra Behn, "The Disappointment"
John Wilmot, Earl of Rochester, "A Ramble in St. James Park"
<online> John Dennis, "A Defense of Sir Fopling Flutter"
John Wilmot, Earl of Rochester, "A Satyr on Charles II"
<online> John Wilmot, Earl of Rochester (? ), "The Royal Buss"
<online> Andrew Marvell, "On the Statue Erected by Sir Robert Viner"
Image: W. Vincent, Anne Bracegirdle as "The Indian Queen"
<online> Robert Beverly, "An Account of Bacon’s Rebellion"
Jeremy Collier, "Remarks on the Relapse"
<online> Colley Cibber, "Dedication to Pelham"
William Congreve, "Concerning Humour in Comedy"
<online> Sir John Suckling, "I prithee spare me gentle boy"
<online> Sir John Suckling, "There never yet was woman"
"Harlequin & Punch Kick Apollo Out"
Image: "Performed at a Little Theatre with Great Applause"
Image: William Hogarth, "A Just View of the British Stage"
Image: "The Player’s Last Refuge"
Joseph Addison, "The Puppet Show"
Image: Henry Overton and Amedé Van Loo, "The Reverend George Whitefield"
Image: Mr. Garrick delivering his Ode at Drury Lane Theatre…. Goldsmith, "A Description . . . "
Image: William Dickinson (after John Hamilton Mortimer), Mr. Parsons and Mr. Moody in the characters of Varland and Major O’Flaherty, in the ‘West Indian’, mezzotint, 1776. Image: The Middle Temple Macaroni. In short I am a West Indian!, from The Macaroni Scavoir Vivre and Theatrical Magazine, July 1773, 511, etching. Image: Portrait of Mr Shuter and Mrs Green as Mr and Mrs Hardcastle and Mr Quick as Tony Lumpkin in She Stoops to Conquer, mezzotint, 1775. <online> "Mr. Quick in the character of Tony Lumpkin"
The Town and Country Magazine, "History of the Tête-à-Tête or Memoirs of the hon. Capt. H____y and Mrs. N______t." Image: Scene from 'School for Scandal' being performed in Drury Lane Theatre, London; four actors on stage, the audience watching from boxes on either side. etching and engraving, 1778. Image: Chas. White, A Masquerade Scene in the Pantheon, engraving, 13 March 1773. Image: John Dixon, Inside View of the Pantheon, etching, 25 May 1784. <online> George Cruikshank, Wowski Lottery Ticket. The Morning Herald, Jan. 30, 1793. The Star, Jan. 30, 1793. The True Briton No. 26 (Jan. 30, 1793). The World, Jan. 30, 1793. Critical Review, new series 7 (Feb. 1793): 223-4. The Thespian Magazine 1 (March 1793): 234-5. Image: George Dance, Elizabeth Inchbald, pencil, 1794. Kristina Straub is Professor of English at Carnegie Mellon University. Misty Anderson is Professor of English and Adjunct Professor of Theatre at the University of Tennessee, Knoxville. Daniel O’Quinn is Professor in the School of English and Theatre Studies at the University of Guelph.